The Special Service Package (SSP) was a factory optioned Police Car. 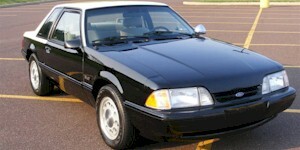 Ford offered this package on the Mustang from 1982 through 1993. It was built upon a LX 5.0L Notchback with either the 5-speed manual or 4-speed automatic transmission. The package added; front lower radiator air deflector, remote trunk lid release, engine oil cooler, reinforced front floor pans, aircraft style radiator and heater hose clamps, single key locking system, external oil cooler (automatic transmission), heater hose inlet restrictor, heavy duty front bucket seats, underhood sound absorber delete, full size spare tire, certified 0-160mph speedometer, P215/65R15 95V BSW all-season performance Goodyear Eagle GT tires, and 15x7" 10-hole cast aluminum wheels.